1. Prologue for Ajijaack (Crane) 2:17 Ambient electronics created by Larry Mitchell, with spacious cello motifs by Dawn Avery follow Crane sounds recorded in their natural environment. This sets the tone for the birth of the story’s main character – Ajijaack (the Ojibwe name for Crane), as she begins her auspicious and heroic journey. 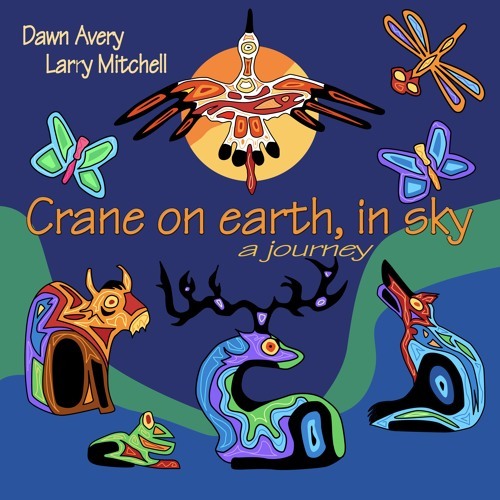 Music and lyrics for Crane on Earth, in Sky: a Journey are written by cellist and vocalist Dawn Avery and guitarist/producer Larry Mitchell. This Native downtempo album features storytelling through sonic landscapes - filled with the sounds of animals, strings, electric guitar and electronics, with lyrics sung in Mohawk and English. The recording is the soundtrack of the off-Broadway play Ajijjack, created by Heather Henson of the Jim Henson family legacy, and Grammy Award winning multidisciplinary artist Ty Defoe (Ojibwe/Oneida). It is the story of the majestic Crane, who restores language, culture, and balance to the earth with the help of Native ancestors she meets along her migratory journey.